For a business owner, what is the best Christmas gift? It is high, sales volume, improved revenues, and higher purchase rate per day. The festive season is the most sensitive as well as lucrative market across the globe. And in this time period, taking the lead from the competitors might require additional efforts and strategies. So, if you are looking to improve your business performance this Christmas then do ponder on the below mentioned points. These following points will not only help you to understand what are the best practices adopted by successful business owners but, will also let you know how to implement them in your business vertical. 1. Boost Positive Reviews: Whether it is an iOS App development or android app development, ensure that you always highlight the positive reviews of your customers in the best possible manner. Reviews are considered in App stores while listing the apps of different niches. More the number of positive reviews, more will be the chances of getting your app listed on the top. The more the visibility, the more will be the probability of getting it downloaded. 2. Analyze Competitors And Their Strategies: Everybody is preparing for Christmas and, therefore never underestimate your competitors. There are chances that you might get to learn something new from your competitors from which you can devise new strategies to excel. Make sure you are in-line with the latest trends prevailing in the market to attract the customers in an effective manner. Following the strategies adopted by you last season will not help you in getting enough attention from the customers unless you are a big brand, whose name is enough to attract the prospective customers. If you want to get noticed among the tough competition, then your app should be ready with the latest marketing strategies and design. It needs to be sharp, do your homework, identify the key keywords of this season and decide which are the ones you want to target. Also, if your aim is to be in the colour of localized areas, then you need to be even more vigilant. 3. The App Should Be In Festive Colour: Get in touch with your mobile application development company and ensure that your app reflects the festivity in all respects. Opt a temporary theme, and cover photo keeping in mind Christmas. If you are not looking to do much then a small banner, or just some minute affects will also speak a lot about your take on this festive season through your app. Apart from this, the content of your app should be also sync to Christmas season. Redesign your messages, marketing taglines, and banner texts in a way that looks appealing to the audience. 4. The Availability Of Your App: You might be a die hard iOS user but, it is not important that your customers are also the same. Do ensure that your app is available for maximum number of Operating Systems. Most important are Android and iOS. Many developers tend to work with XCode, even the standards for developing apps for Android are lower when compared to iOS therefore, the availability of apps on Android platform is higher. But, to be cut short your app should be available for both the platforms because you never know which customer might change its operating system. 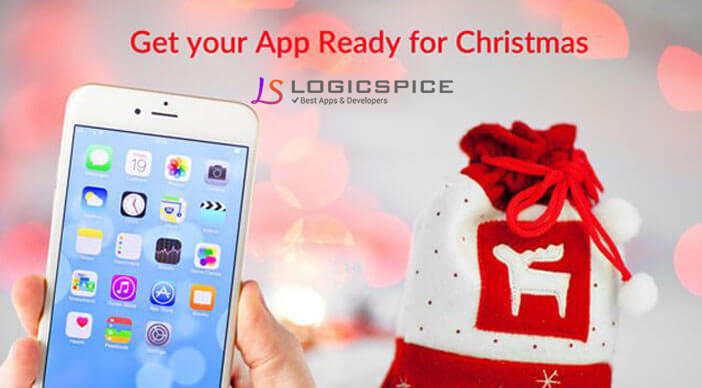 LogicSpice are committed to deliver best results to our clients and if you are looking to get immediate help for your app and business, then our professional team is always up to give you optimal help at affordable prices.